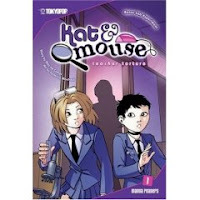 Kat and Mouse Vol 1: Teacher Torture. Storyby Alex de Campi; Art by Federica Manfredi. Copy supplied by publisher, Tokyo Pop, in support of Cybils. Cybils finalist. Kat is the new kid at school and the teacher's daughter. Mouse is the "cool nerd" whose special power is "shield of apathy." (Hey, that's MY super power! No fair!) Together, they navigate 7th grade. And solve crimes. I like a good school story. And I also like that it's a solid detective story (someone is blackmailing Kat's father to make him give good grades.) Kat & Mouse's friendship is real, and their actions believable. Kat's nice; she doesn't like being picked on and bullied (who does? ), but she isn't yearning to be friends with the cool, popular crowd. True confession: I'm the type of person who even in school liked having a small group of good friends, got along with most people, and had no interest in being "popular." Couldn't understand it then, and so have a hard time now with books where that (being popular!) drives the character. I much prefer a book like this which is about having friends, having fun, but not sacrificing self. Age: this is perfect for younger readers. I can see the Babymouse readers liking these a few years down the road. A must-get for school libraries and libraries adding graphic novels to their children's collection. This looks really interesting! Thanks for posting about this book. Sounds like lots of fun, I'll have to see if my library has it!